So, since Google I/O 2018 I've been seeing a lot of posts about who likes what voice of their Assistant better, and even some who try to give them 'names'. Well, without an English (US) language set, you won't see the options to change it. You're supposed to be able to go into the Assistant, or Home app and in more settings find preferences and then see the option for voice outputs. But we can't even see that settings. However, thanks to a reply from +Randy Donald on my post there's a clever trick to bring up the settings. 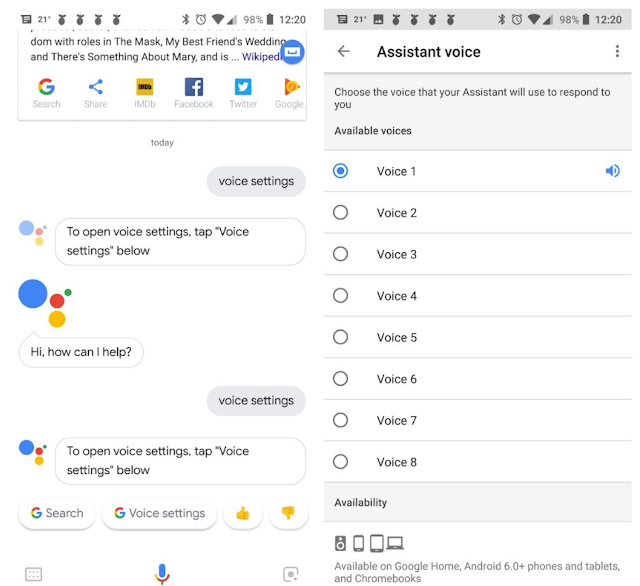 Just launch your assistant and ask for 'voice settings', and then it gives you theoption to go straight there. Even though you can't see it in the app settings. First is that even though you tap the other voices, you can't hear a demo of them. So as +Shaun Aston points out, you'll have to set one, then try it out with a Google Assistant query to hear what it sounds like. Kind of annoying as to get back to the screen you'll have to ask for voice settings again. The other is that this changes the voice FOR YOU. My son still has the normal voice coming out of our Google Home mini when he asks a question. Still, pretty cool to get the voice you want. I'd still like to find a way to get an Australian accented voice for me... I think that was only for Google Play Books tho'. Anyways, which voice is your favourite?